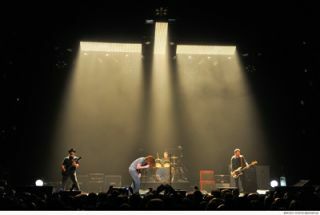 Seattle-based rock band Soundgarden’s new King Animal Tour hit the road with Chromlech Elidy LEDs and a grandMA2 console supplied by Upstsaging. A.C.T lighting is the distributor of Chromlech Elidy fixtures and the MA products in North America. The national tour is in support of the rockers’ sixth studio album, also called “King Animal,” which was released last November. Their first engagement played Washington, D.C.’s D.A.R. Constitution Hall in January. French-made Chromlech Elidy fixtures are capable of projecting volumetric graphics. They combine high-output, calibrated, warm white LEDs with specific optics to generate extremely narrow beams that far exceed the intensity of LED screens. Elidy fixtures are also decorative items that can blend into scenery, backgrounds and décor by using a wide range of accessories, including new customized covers. These covers are attached either magnetically or as a snap-on and change the panels’ appearance to take on different colors and textures, including wood, metal, mirror, leather, stone and even grass.